France’s broadcasting regulator recently issued a warning to the French division of Russian television channel RT for falsifying facts in a programme about the use of chemical weapons in Syria. The following day, the Russian state media regulator accused French television channel France 24 of violating Russian media laws. As relations between western countries and Moscow deteriorate, France nears passing “Fake News” regulation to hit back at RT, while France 24 risks having its operating licenses revoked in Russia. At least 40 people died earlier this year from exposure to chlorine and sarin gas in the Syrian town of Douma. The attack provoked global outrage and Western governments blamed the attack on Syrian President Bashar al-Assad, a Russian ally. Within days, the United States, Britain, and France led retaliatory missile strikes against Assad’s suspected chemical weapons sites. Several days later, RT France aired a segment entitled “Simulated Attacks” during its evening news programme, which dismissed the chemical weapons attacks as staged. Furthermore, RT France dubbed over the voices of Syrian civilians with words they had not said. The portrayal of the Syrian attack in such a manner may be a violation of its contractual, and regulatory obligations under French law. Bolstered by the popularity of its French language website and YouTube channel, RT took the decision to open a Paris bureau after the Élysée Palace refused to provide RT reporters with press credentials to cover presidential news conferences. Previously, the state-backed broadcaster had been criticized by French President Emmanuel Macron as “behaving like deceitful propaganda” which “produced infamous counter-truths about him.” As a presidential candidate, Macron was targeted by a campaign of fake news and hacking attempts from Russia, and he is reported to have taken the affront personally. I have decided that we are going to evolve our legal system to protect our democracy from fake news. The freedom of the press is not a special freedom, it is the highest expression of freedom. If we want to protect liberal democracies, we have to be strong and have clear rules. article 2-3-6 —The publisher will demonstrate precision in the presentation and treatment of news. It will ensure the balance between the context in which images were taken and the subject that they show [and] cannot distort the initial meaning of the images or words collected, nor mislead the viewer. France 24 broadcasts in English on Russian satellite packages, and has about 1,348,000 weekly viewers. 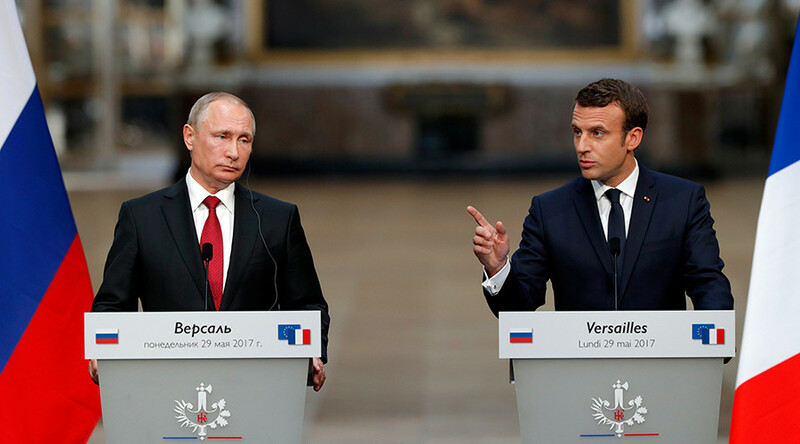 In a statement, Russia’s Federal Service for Supervision of Communications, Information Technology and Mass Media —commonly known as Roskomnadzor— identified a violation of media law by France 24 in Russia. This would violate Article 19.1 of the Russian Mass Media Law, which was amended in 2016 to restrict foreign ownership of media companies. The law bans foreigners from holding more than a 20 per cent stake in Russian media outlets, effectively forcing them to be controlled by Russian legal entities. RT is widely acknowledged as the Russian government’s main weapon in an intensifying information war with the West. In respect of media ownership, it is no secret that the Kremlin uses direct ownership to influence publications and the airwaves. Each Russian TV channel is fully or partially owned by the state except for one, NTV. Even so, NTV is owned by Gazprom, the natural gas giant in which the government has a controlling stake. Because of the constrained political environment, Russian media are unable to resist the pressure from the state and succumbed to the well-known propaganda and conformism pattern according to which they’ve been operating in the Soviet times. The period of the relative freedom of press ended with Vladimir Putin ascension to power, which was too short for the Russian media to become a strong democratic institution. In the wake of alleged Russian interference with American elections and the Brexit referendum, lawmakers now face the challenge of regulating a defiant type of expression. Is this propaganda masquerading as journalism, which should be curtailed or even censored ? Or is RT simply a voice from a different perspective? Should viewers be trusted to make the best decision as the information wars carry on? In France at least, the road to regulation seems to be preferred. After fierce debate, the French Parliament approved draft legislation to allow courts to determine whether articles published within three months of elections are credible, or should be taken down.